In previous posts, I have discussed importing the Tate’s metadata into a Neo4j database using Neo4j’s BatchInserter. 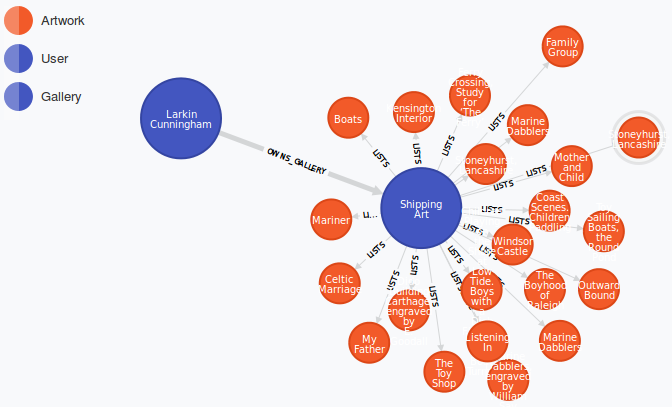 I have been able to run some interesting queries using CypherQL to visualise the connectedness of some of the Tate metadata, including shortest paths between artists to illustrate what they have in common. But all of that is foundational stuff. What the bulk of my research (for my PhD in particular) is concerned with is building a social media platform for cultural heritage objects. The Tate metadata can be viewed as an exemplar of an open data set, with its high-quality metadata being an excellent seed for my project. I may come to view the Tate’s approach to metadata as being my standard, or I may come up with a multi-museum/gallery compromise standard and map the Tate’s to mine – bearing in mind various standards for metadata, such as Dublin Core. But I have turned in the last couple of weeks to the development of this new social media platform – notwithstanding the fact that I still have some work to do on the importation, such as a little bit of data cleaning. A discussion then about the technological side of the new platform. I have for a number of years used the Spring Framework. While I used it a little bit in a job I had a good 8 or 9 years ago, I first became somewhat expert with it when I started to teach it to higher diploma students about 2.5 years ago. The pace of development by the contributors to the Spring open source project is actually quite staggering. In the past 2.5 years, the introduction of the likes of Spring Boot have massively simplified the configuration of projects. It is much easier now to get straight to what we would call the implementation of business logic, which is where the real value lies. Having said all that, I have not been immune to the frustrations involved in getting to grips with a new enterprise-grade product. As far as programming goes, this is pretty high-level stuff. I have been getting to grips with things like Spring Data repositories, Neo4j object-graph mapping, and getting Spring Boot to work to the extent that I have eliminated all XML configuration from the project. I think it’s far to say that I am developing this product the right way from the ground up. If others were to join the project, I’m confident that they will be able to find their way around it easily enough. I’m also confident that it will scale. Using a graph database (Neo4j) and Spring’s support for object-graph mapping (OGM) makes implementing the above list much easier than it would be using, for example, a relational database. While an RDBMS can be used, the ability to simply link two objects in a graph database using 1 or 2 lines of code cannot be overstated. When I retrieve a user, it will eagerly fetch the list of friends for the user (note the bidirectional relationship, FRIEND_OF, from user to user). The user service class retrieves the user object for the new friend and as long as the two users are not the same (cannot friend yourself, of course), then calls the befriend method in the User entity to toggle the friendship on or off. repo.save (i.e. call the user repository object to persist) handles all of the connecting in the background. As yet, the website has no styling and I am not displaying full artist or artwork records. In fact, I am not even displaying artwork images just yet. I am concentrating right now on the fabric of the system. Beyond that, the next major piece of development may well be a recommendation engine.